I never paid much attention to the music of Eric Dolphy, although I own a few of his recordings. At the time I purchased his classic Out to Lunch, I was trying to broaden my jazz horizons but found the music too avant. But then, I used to think Cecil Taylor was the one who was “out to lunch.” I’ve since reevaluated my opinion of Taylor. And thanks to the revival of interest in Dolphy’s work by a group of local artists, I have reevaluated Dolphy as well. I now consider his music to be fascinating, exciting, harmonically and melodically freeing, in a good way. About three cold Februarys ago, vibraphone master Dave Hagedorn organized a tribute to the music of Eric Dolphy at his home campus of St. Olaf College in Northfield. He enlisted the contributions of some of the best in the Midwest or anywhere else, for that matter—Phil Hey on drums, Tom Lewis on bass, Kelly Rossum on trumpet, and Dave Milne in the Dolphy role of multi-reedman. What, no piano? True to Dolphy’s arrangements, no keyboard. I recall that it was about 20 below zero that night and I probably would have passed on the trip if Don Berryman had not encouraged me to attend. Surprisingly for a cold cold night, the small auditorium was packed, probably in no small part due to the popularity of Hagedorn and the enthusiasm of his jazz students. But the chill abated quickly as the heat of creation turned to joyous steam rising from the Out to Lunch Quintet. Wow, this was not your usual Saturday night jazz! Hearing it, seeing it live, it was challenging music but filled with surprises, humor, outlandish harmonies, and wild solos from everyone, an experience that has been thankfully repeated several times over the past two years at the Artists Quarter in St. Paul. Dave Milne plays every reed imaginable from bass clarinet to soprano sax, with alto and C-Melody saxes in between. Kelly Rossum blows through both ends of his trumpet, stuffing mutes of every shape into the bell or waving a tin “hat” across the airway. Dave Hagedorn, my nominee for the best vibes player on the planet, seems to grow two more hands swinging a dozen mallets, but I guess he really has but two hands and no more than four mallets at a time. Sleight of hand, certainly. 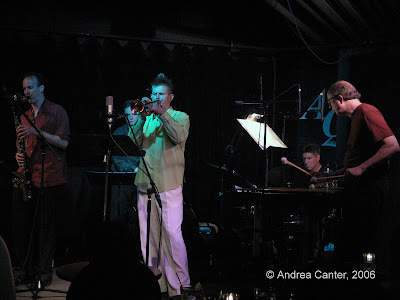 Tom Lewis, who can be the most subtle of bassists when backing a singer, is dazzling and assertive when wearing his Dolphy shoes, and Phil Hey, also prone to elegant subtlty, becomes downright aggressive and playful behind the trapset, moving well beyond timekeeping to time making. The OTLQ recorded Live at the Artists Quarter a few months after that night in Northfield and released the result in 2006; ever since, they come into the Artists Quarter for a weekend a time or two each year, most recently last weekend. They had to compete with the state fishing opener and Mother’s Day weekend, drawing a criminally small crowd Friday and a near full-house the next night. While continuing to mine the Dolphy repertoire, OTLQ is ever expanding its horizons, bringing on works from Charles Mingus and Grachan Moncur as well as originals from Milne and Rossum. And Dave Hagedorn announces the tunes with his trademark deadpan that belies a wit as slippery as his mallets. It was a young audience on Saturday night, undoubtedly heavy with past and present students of the educators/performers on stage. I rather like the idea that students of the 21st century are still inspired by the music of the 1960s, and that the source of their fascination goes beyond the Beatles. Interested in the OTLQ? Visit http://www.otlq.com/ for information about the band and their recording.